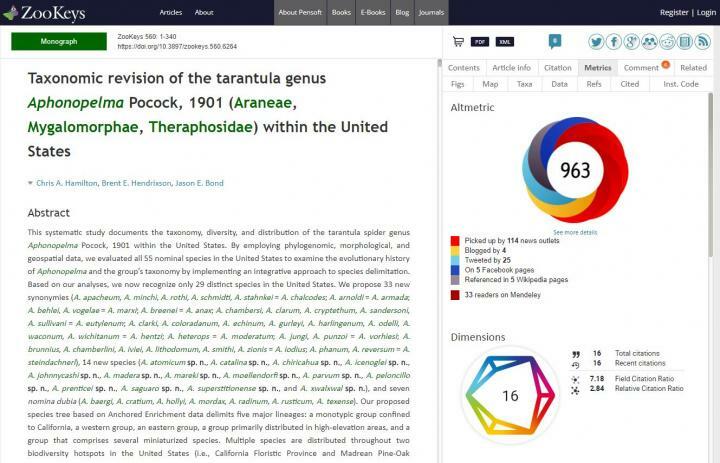 A single click on the Metrics tab within the menu of any article in an ARPHA-published journal reveals the new eye-catching Dimensions badge, where it appears beneath the popular colourful "donut" of Altmetric – another research analytics innovation developed by Digital Science. A single click on the Metrics tab within the menu of any article in an ARPHA-published journal reveals the new eye-catching Dimensions badge, where it appears beneath the popular colourful "donut" of Altmetric — another research analytics innovation developed by Digital Science. "There is no doubt that citation count and real-time, real-life impact within both the scientific community and the public space are essential for any scientist," said ARPHA's founder and CEO Prof. Lyubomir Penev. "In this sense, analytical and user-friendly tools, such as Dimensions and Altmetric, come to bridge a crucial gap — one which could easily make-or-break a researcher's career and image in academia." "I am pleased to ensure that any author who has ever published with our journals can easily and openly track and demonstrate the actual performance of their work," he added. Christian Herzog, who led the Dimensions project at Digital Science, said "The Dimensions badges were developed to aid the research community in assessing and contextualizing publications. We're happy to partner with ARPHA and contribute additional value to their platform." Dimensions is a modern, innovative, linked research knowledge system that re-imagines discovery and access to research. Developed by Digital Science in collaboration with over 100 leading research organizations around the world, Dimensions brings together grants, publications, citations, alternative metrics, clinical trials and patents to deliver a platform that enables users to find and access the most relevant information faster, analyze the academic and broader outcomes of research, and gather insights to inform future strategy. Visit Dimensions' website at https://dimensions.ai and follow them on Twitter @DSDimensions. Digital Science is a technology company serving the needs of scientific and research communities at key points along the full cycle of research. They invest in and support innovative businesses and technologies that make all parts of the research process more open, efficient and effective.